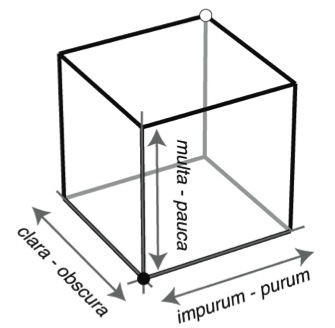 Grosseteste’s three bi-polar qualities of light and medium plotted on a cube. The latest Ordered Universe publication is out; a second piece in Nature, this time in Nature Physics. ‘All the Colours of the Rainbow’, which was principally authored by Hannah Smithson and Tom McLeish, with Giles Gasper, provides the outline of the way in which Grosseteste’s thought on colour moves between the De colore ‘On Colour’ and the De iride ‘On the Rainbow’, and the startling ways in which this can be mapped into contemporary models of human colour vision space. 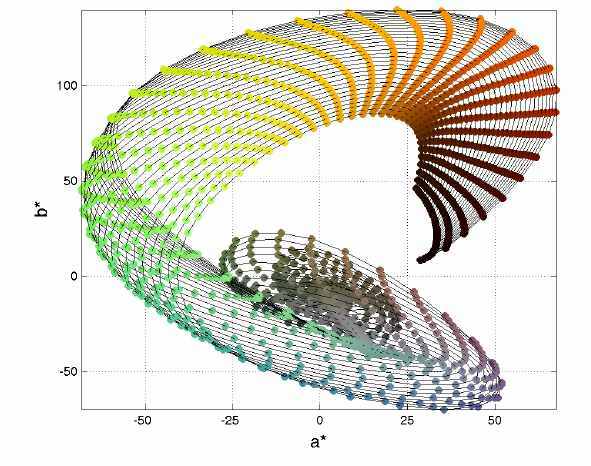 The full article is available at Nature Physics: http://www.nature.com/nphys/journal/v10/n8/full/nphys3052.html. University libraries should have subscriptions, Durham does, so, unless you already subscribe, that’s probably the best way to access the text. The interlocking of Grosseteste’s creative imagination, and the wide range of sources with which he engaged, alongside keen observation (a skill which emerges in his rich use of metaphor and analogy), with modern thought on human vision and an equally creative and imaginative approach to science, produces a powerful kaleidoscope of ideas and possible interactions.